Five years ago this month, I joined a preschool co-op with my older son Graham. He was 11 months old at the time. I had been told, by multiple friends, that co-op was the way to go. Not so much for the children but for the community with other moms. To all my friends who made this recommendation – thank you. I now have lifelong friends because of the time we spent at that co-op. We were only in that co-op for two years but a small group of us still gets together on a regular basis. We usually go out for dinner and sometimes we allow the husbands to come along with us. Last week met up at someone’s house and the timing happened to coincide with our friend Kimrick’s birthday. When I asked her what kind of dessert she wanted she said chocolate. That’s my girl. Because I had just made a cake, I opted to go the tart route this time. This one features a chocolate cookie crust, a chocolate pudding middle, and a crème fraîche whipped top. The only slightly negative thing I can say about his magical creation is that it isn’t all that easy to cut. There are worse problems to have. I’m a sucker for a chocolate cookie crust – even though it is nothing but chocolate wafers, sugar, and butter. But the star here is the pudding. As I was making it, I remembered the snack packs my mom used to put in my school lunch box. I thought that chocolate pudding was the most delicious thing I had ever tasted. I’m still a sucker for chocolate pudding especially with a topping as decadent as this one. For some reason, those chocolate cookie wafers can be hard to find. I have successfully used the Whole Foods brand of chocolate cookie grahams. Position rack in center of oven; preheat to 350°F. Blend cookie crumbs and sugar in processor. Add melted butter; process until crumbs are evenly moistened. Press crumb mixture onto bottom and up sides (not rim) of 9-inch-diameter glass pie dish. Bake until crust begins to set and no longer looks moist, pressing gently with back of fork if crust puss, about 12 minutes. Remove crust from oven, then sprinkle chopped chocolate over bottom of crust. Let stand until chocolate softens, 1 to 2 minutes. 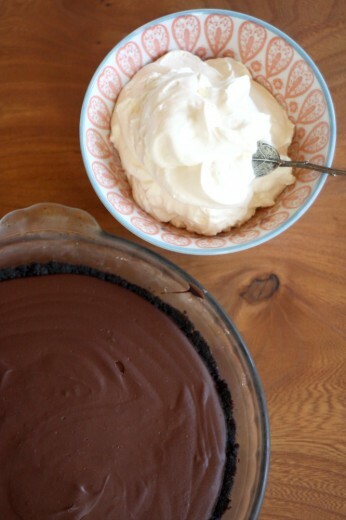 Using offset spatula or small rubber spatula, spread chocolate over bottom and up sides of crust to cover. Chill crust until chocolate sets, about 30 minutes. 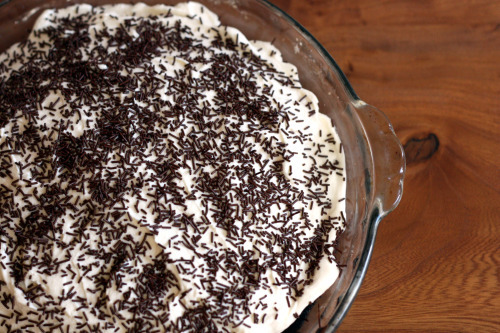 Sprinkle chocolate shavings or sprinkles decoratively atop pie. Wow! Looks beautiful and amazingly delicious. Oh my gracious! You are a baking inspiration. I miss you. I would like to eat chocolate pudding with you, too. I got together with the same group of women for 4 years when my kids were born, and when we moved out west, leaving them was almost as hard as leaving my relatives. The relationships formed through parenting are definitely tight, and genuinely long-lasting. Now can I have more pudding? 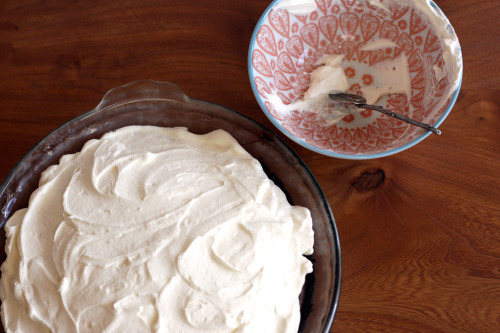 My mom makes chocolate pudding pie for Christmas every year although she uses pudding from a box. I think I’m gonna have to tell her it’s getting an update this holiday. This sounds amazing. I might need to go make that chocolate pudding, like right now! I am also a sucker for chocolate pudding. Yum. Oh, and birthdays, and baby co-ops too. Your friend is lucky to have you! oh wow this looks delicious! i love chocolate pudding! 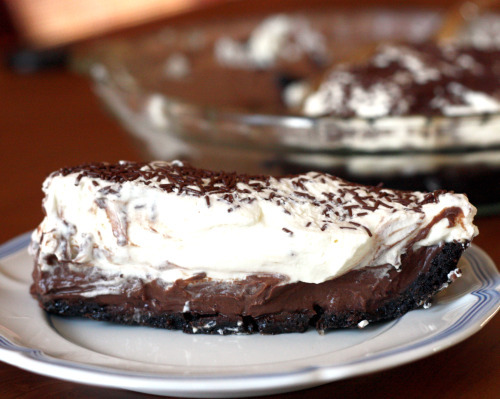 The creme fraiche topping sounds fantastic with the chocolate filling. I’m always interested in good pudding recipes. Every one I try seems like it’s not quite right. This is going in the must try stack! This looks absolutely stunning! I can almost taste the chocolate… I’ll have to give this recipe a try. I’ll just need a spoon, thanks! Ok, so I only made the chocolate pudding, not the whole pie, and I was working with what I had so I made some substitutions. Used plain unsweetened soy milk in place of the whole milk and cream, and Kahlua in place of the rum. And still, it was SO GOOD! Very creamy and chocolatey, and not too sweet. Perfect, IMO. I did find it to be just a little too thick after setting up in the refrigerator, so I whisked in a few more tablespoons of soy milk to get it to the consistency I was looking for. YUM! This looks really good! And I love how nice and thick the crust is, and that there’s chocolate in it!